We’ve been making award winning craft ciders since 1920 when William Churchill acquired the family farm and started making cider as a side line to his blacksmiths business. 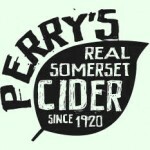 The company was later taken over by Henry and Bert Perry his nephews who pushed the company forward and continued to experiment with craft ciders. Much of the techniques and our current ethos came from these experimentations. In fact we still ferment our ciders in exactly the same way and each year will continue to use the two hydraulic presses installed by them in the 50′s. These presses have squeezed over 7 million pints of cider each. The company passed onto Henry’s wife Marguerite and two sons John and Andrew after Henry’s and Bert’s deaths. Fast forward to today and the company is still run by the Perry family with George, John’s son taking over the day to day running of the company and cider production. John and Marguerite are still very actively involved in the company and cider industry as a whole with John over seeing the company. Today our aim as cider makers is still the same as it has been for the last 90 years – to produce the very best Somerset Ciders with 100% apple juice, and with as little intervention from ourselves and nasty ingredients as possible.